Looking for a venue to host a private celebration near Barking station? Or a venue for a meeting or conference close to London City Airport? Or an exhibition and performance space for your latest show just off the North Circular? Or a yoga, aikido or pole fitness class with parking, just off the A13? The Boathouse Barking is a multi-purpose venue, overlooking the river, in the heart of the Icehouse Creative Quarter. The venue has a strong emphasis on supporting emerging artists, and in fostering involvement and leadership in a wide range of art forms. So musicians, writers and performers have an ideal space for rehearsals, exhibitions, workshops and whatever else they have in mind. The sprung-floor, light-filled, flexible studios are also available for hire at competitive rates for corporate, community and family events. Thanks as always to Rooff, for their generous and ongoing sponsorship of The Boathouse Barking – from the team and all who benefit from this wonderful facility. Join the mailing list and be the first to know about news and events at The Boathouse! You won't get bombarded with junk mail. But you will be at the front of the queue for everything that's happening at the riverside. 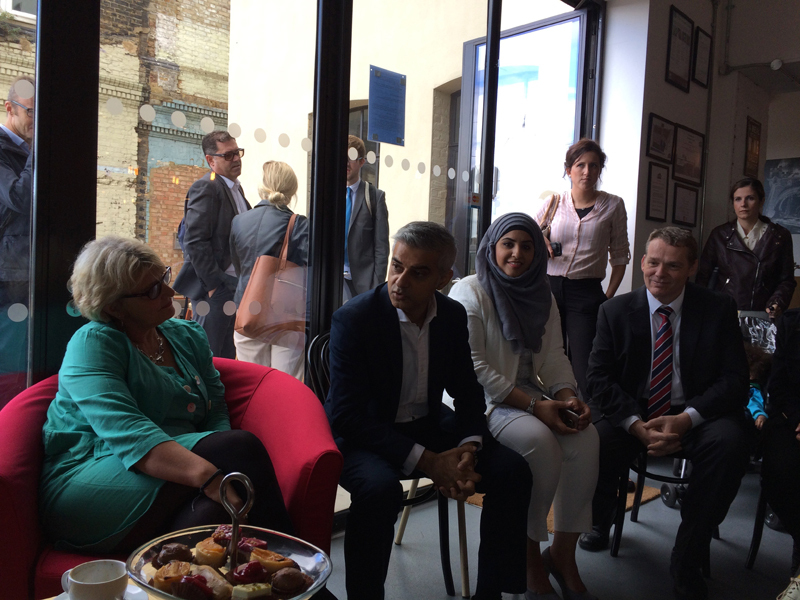 The Boathouse CIC was delighted to host the Mayor of London, Sadiq Khan, shortly after his election. He was given a whistle-stop tour of arts venues and organisations in Barking and Dagenham by Councillor Darren Rodwell. During a break for tea and cakes at the Boathouse Cafe, we brought together artists, cultural connectors and arts businesses to share ideas with the Mayor, and to talk about growing the relationship between culture and regeneration. He believes passionately that the arts have a central part to play in community and the built environment, and recognises their important contribution to the economy. Rooff is a construction developer and a key partner in the arts in Barking and Dagenham. The company owns the Granary and Malthouse Buildings, home to the Boathouse Creatives Studios, and is a primary sponsor and supporter of the Boathouse CIC. Steve Drury, Development Director at Rooff, is the Chair of the Boathouse CIC board.